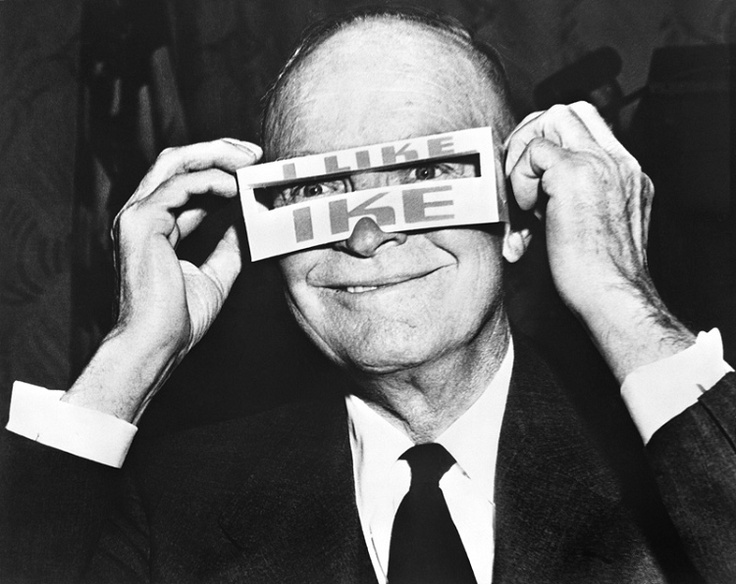 Hint: Eisenhower has something to do with it. I don’t show my patriotic colors all that often, but I’ll never forget how furiously I defended Americans’ love of travel when my multi-national friend told me the statistic that only 30% of us have passports (today it is closer to 46%). At the time, I had just taken a fifteen-day Amtrak ride around the continental US with my closest high school buddies after graduating. We had seen sun-drenched deserts, crystalline mountain peaks, smokey backwoods, polar vortex-blasted lakes and every type of imaginable city and small town made up of a myriad of cultural backgrounds and creeds in between- and we saw it all without needing passports. Still, the point about American’s seeming aversion to international travel is a fine one to make, and presuming that one can learn as much about the world from within their national borders as beyond them is simply untrue. What my friend didn’t know is that the reason Americans don’t leave their borders isn’t just because of all of the tourist destinations in their home nation, or a fear of the unknown outside world where people might not speak “American,” but also because we are culturally and politically invested in making traveling within our borders as marvelous (literally, full of marvels) as possible. Firstly, choosing a road trip over air travel when you live within the United States makes a lot of sense, considering that one of our largest public works projects ever is the 46,876 miles of mostly toll-free highways that link every corner of the continental US, from the Gulf Stream waters to the Redwood Forests. That project is the US Federal-Aid Highway Act of 1956, which was drafted under President Eisenhower- although FDR’s lackluster Federal-Aid Highway Act of 1938 was a precursor. The resulting product of this bill is still the second largest such system in the world (after China, whose highway system probably surpassed America’s in 2011) and the story of its inception says quite a bit about why it was so important to make traveling within the national borders so easy for Americans. After witnessing the advantages for the Axis armies (and then the Allies) of the German autobahn system during the second World War, then-General Eisenhower realized that such effective highways offer a huge boost to building the economy as well as moving goods and services (including troops). 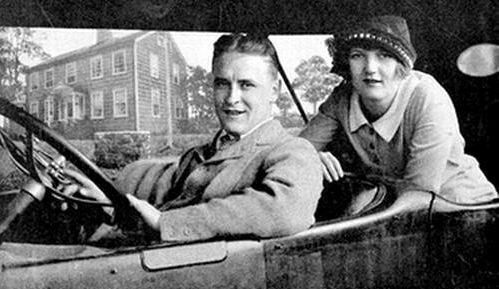 He had a good basis of comparison, too, having been in what historians might call the “worst American road trip of all time” in 1919. 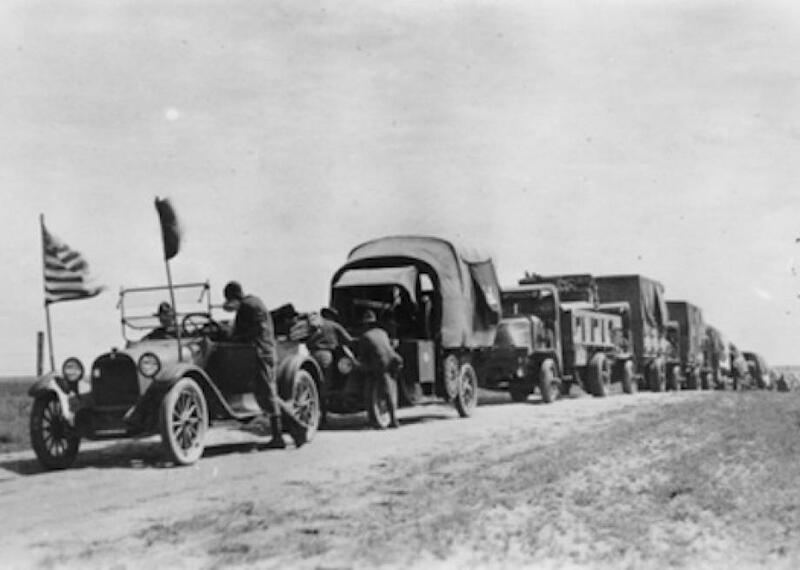 A picture of the cross-country military convoy that President Eisenhower was a part of in 1919, which was near disastrous thanks to terrible roads. But hey, at least there weren’t any tolls. 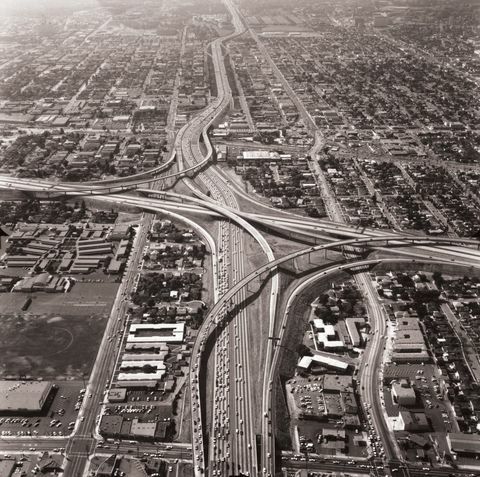 That perspective proved incredibly infectious to mid-20th century members of congress and city planners, such as the now infamous highway enthusiast Robert Moses, and it changed the way Americans traveled forever. 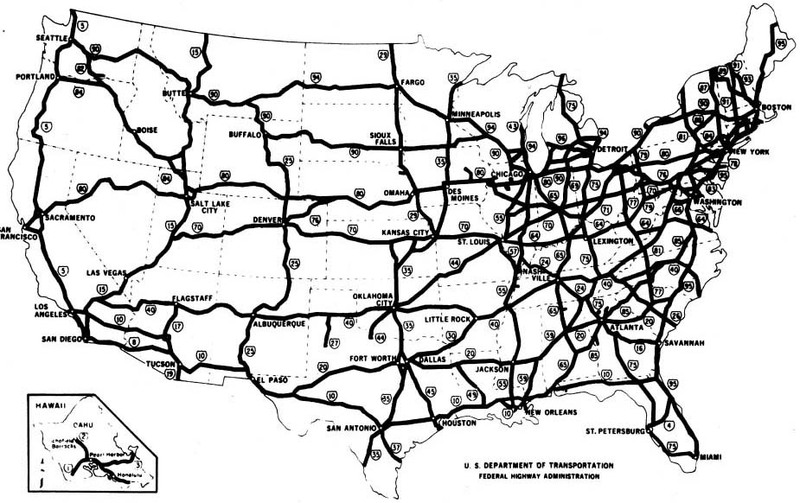 A map of the highways planned after Eisenhower’s 1956 Act. In 1991, it was estimated that federal aid to the highway system had covered about 90% of the costs, or $119 billion, and when a government builds something that humongous and expensive, you want to encourage people to use it. So the federal government (imagine dark clouds gathering in foreshadowing) kept the majority of interstate highways free to use and subsidized gas companies to keep prices low and encourage driving, something that it does controversially to this day. This is why 87% of us who are elligible drive have licenses to do so and when we travel domestically, 79% of us choose to drive. New interstates sped middle-class Americans to national parks and modern marvels like Mt. Rushmore, The Hoover Damn, Yellowstone, Niagara Falls and Disneyland, and they gave us the scenic drives through deserts, mountains and alongside oceans that have become iconic of the American Road Trip, which was no longer the arduous and slow journey made by Mark Twain in a horse drawn carriage, or by F. Scott and Zelda’s in their “rolling junk.” This new trip was made in Ford Coupes and Chevrolet Impalas on pristine ribbons of concrete that glided uninterrupted across a yielding virginal landscape, be it one of grassy planes, mountain peaks or city suburbs. 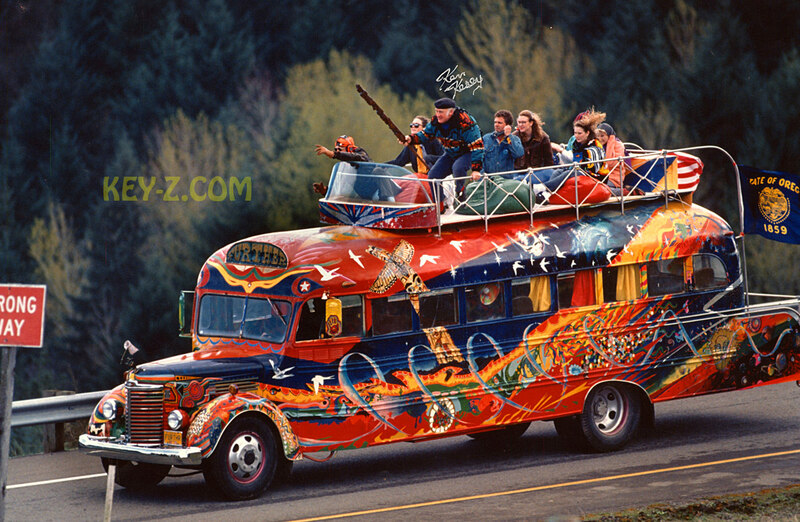 Early American Interstate users like Ken Kesey and his merry band of LSD enthusiasts, John Steinbeck, Tom Wolfe and Robert Frank both romanticized and denigrated the new interstate system for making travel so accessible and convenient to all. The Merry Band of Pranksters were made famous by Tom Wolfe’s “The Electric Kool-Aid Acid Test,” as was the notion that enough paint will make a school bus look fashionable. One of the unintended results of this newly acquired speed was the decline of America’s mythologized roadside attractions, and the small towns that Jack Kerouac praised were often bypassed and left in the dust. Still it is hard to picture Woodstock being as big as it was without the presence of the I-87, which helped shuttle musicians and sexual revolutionaries up from New York City in droves (more foreshadowing: the subsequent traffic jam lasted for days as the youth of New York all crammed onto the little interstate, leading most to walking the rest of the way to the music festival). Is It Really That We Don’t Care To See Jolly-Old England? So, we have a nation geared towards road trips over inter-continental tourism thanks to both a political infrastructure (that has favored fossil fuels) and a physical one, but that doesn’t really explain all of why Americans don’t go abroad more often. My multi-national friend, who had lived in three countries by the age of 19 (but didn’t learn to drive in any of them), suggested that Americans were simply too jingoistic and too xenophobic, to consider travelling abroad to be a valid learning experience. Well, it certainly was a lot easier to debate that point before Donald Trump started bludgeoning in the primary polls. But let’s look at another fact: the nation that saw the most American tourists in 2015 is Mexico, many of who drove over from border-states. The runners-up are Canada and Great Britain, although GB is a distant third. According to American Express, Americans expected to spend on average $1,145 per person on vacation in 2013. Considering that the average round-trip ticket price to Great Britain and the rest of Europe can easily be over $1,000, it makes sense that an American family would choose to not pick the ticket that would double the cost of their vacation. Add that to the grim reality that Americans just don’t use as many vacation days as people in other western nations, and that the notion of “gap years” doesn’t exist here as they do in Europe- it seems more like American’s are just hesitant to spend any of their few hours away from work in a cramped pressurized cabin for half a day. This isn’t to say that all American travelers are totally down to visit a different continent, but maybe that they choose to go to places based on what they can afford or visit more easily (it should be noted that until as recently as 2009, the federal government allowed Americans to visit Mexico and Canada without passports). On top of the last 70 years of political decisions and construction of infrastructure when it comes to Americans traveling, there has also been a series of cultural touchstones that really sell the idea that traveling within our borders can be just as life changing as traveling outside of them. Thanks to music from the likes of Woody Guthrie and Bob Dylan, from Avicii to Mumford And Sons, it seems like hitting the road is just that much more cool. But let’s just say that if there were a fast lane from LA to Tokyo, Americans would be the first ones to drive on it (he says, desperately trying to figure out how two years have passed since that masterpiece of Aussie-American culture). Ask Any American: the thought of going through the TSA makes this look desirable.